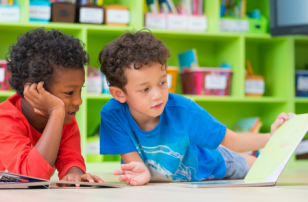 We are fighting a battle against screens with elementary age kids, and this kit helps bring together the desire for tech with creativity and invention! 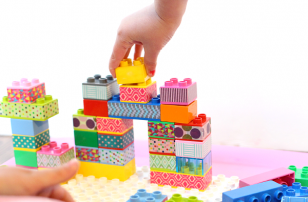 These high-tech invention kits are really one of the best holiday gifts for kids 8 and up. 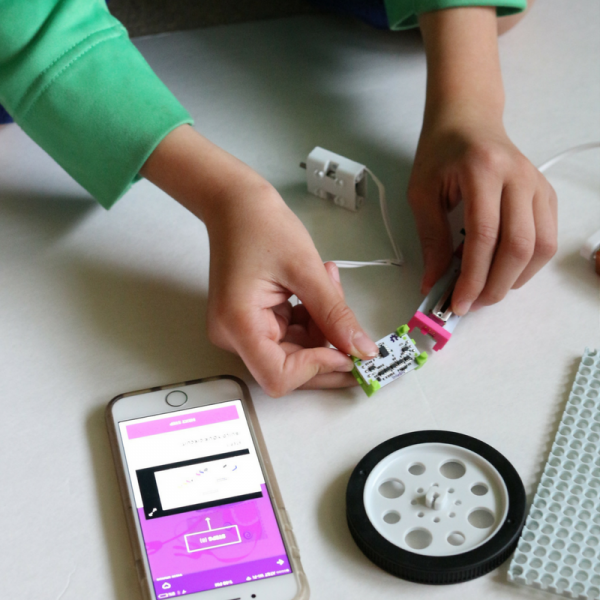 When my friends over at littleBits asked if my kids and I would try out the kit for a sponsored post I was thrilled and even more thrilled when they told me that they would like to send a kit home with one of my readers. 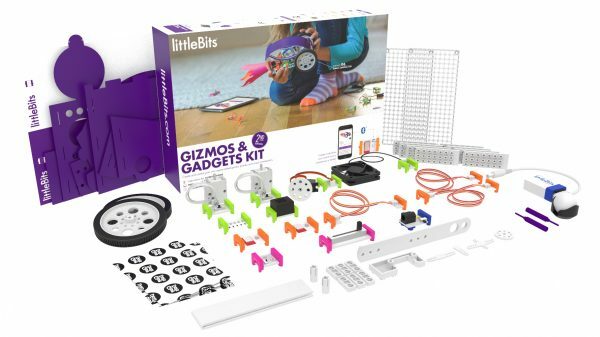 When the littleBits kit came we ripped it open and started inventing right away we’ve been fans of littleBits for ages, it is a completely accessible invention toolbox, and the 2nd edition of the Gizmos & Gadgets Kit is even better now. The new smartphone app makes being an inventor and controlling your inventions even easier. 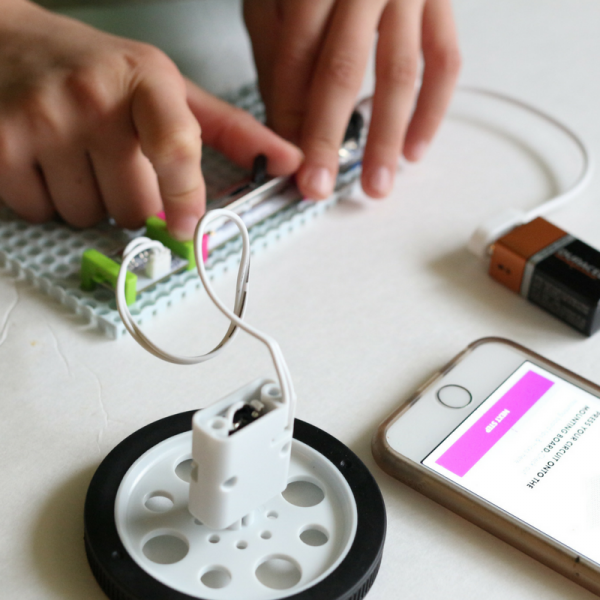 The feature my kids were the most excited to try out was the new Bluetooth bit that allows makers to use their smartphone to control different parts of their inventions. 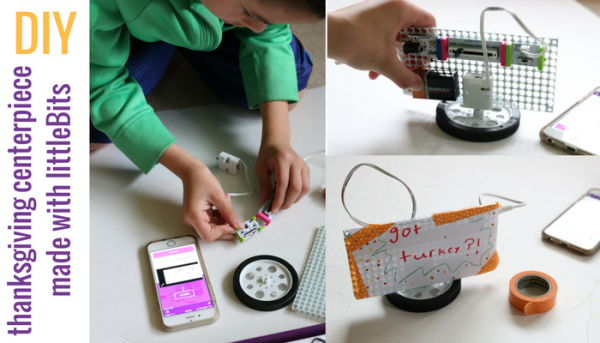 We made a buzzer, a remote control car and even controlled my smartphone camera from our own invention. But the invention we decided to share with you is the Spinmate that we turned into a Thanksgiving centerpiece. 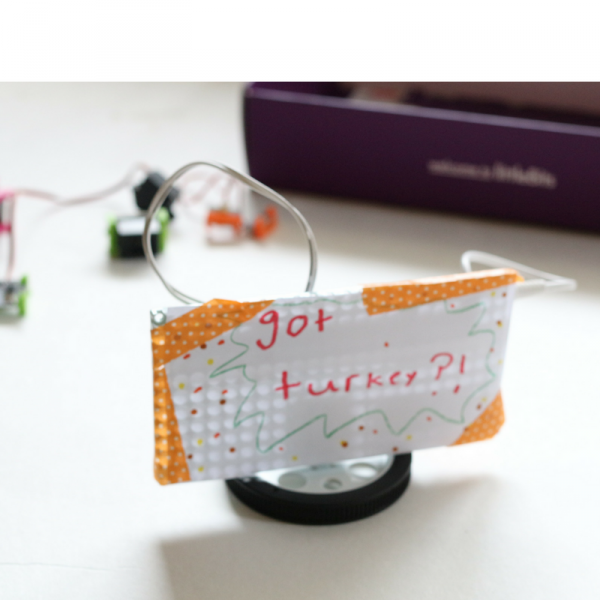 Using the instructions on the app my nine-year-old made this spinning Thanksgiving sign. The steps are easy peasy and other than the paper and washi tape everything needed came in the kit, even the battery. 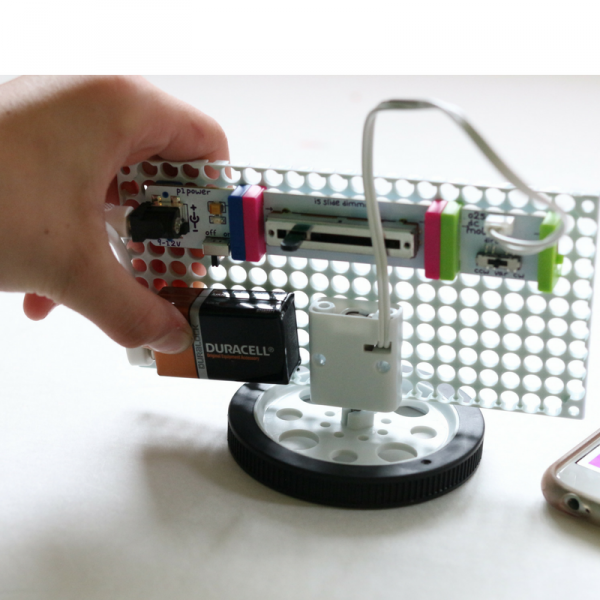 What is even better than the easy step by step inventions is the easy tutorials and the maker community that littleBits has created. There are tons of great community created inventions and tutorials to keep making new things with your Gizmos & Gadgets Kit. 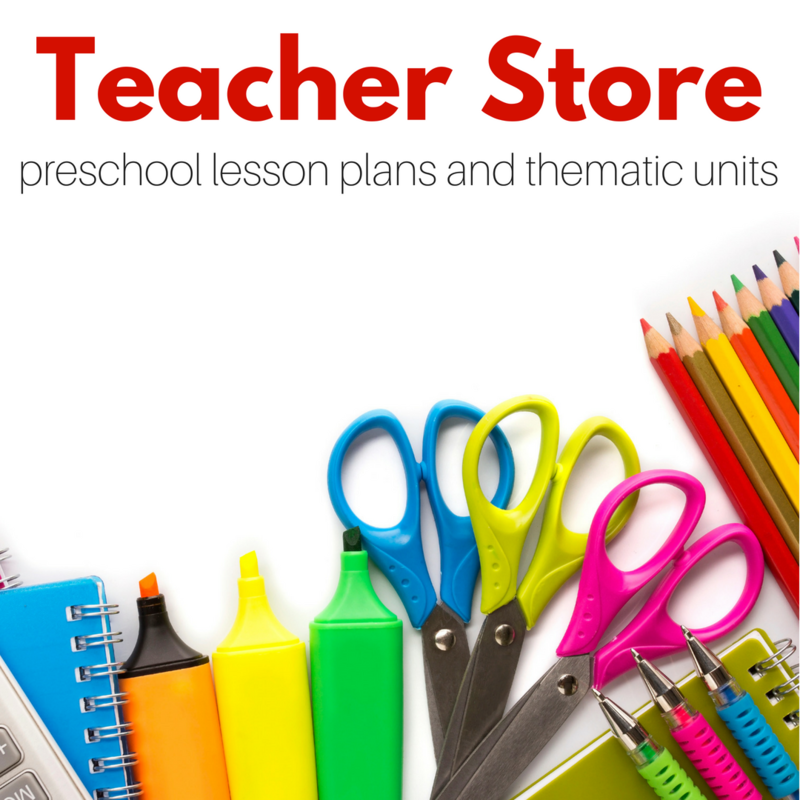 I really appreciate how easy this kit is to use and how much it appeals to my son who is sorta over making crafts and he gets his fill of art at school – so this is a great way to keep making things. Check out our invention in motion! Leave a comment telling me what you are thankful for. That’s it! This sweepstakes is open to American residents 18 years or older. To be eligible for the sweepstakes you must leave a comment on this post answering what you are thankful for. One winning commenter will be drawn at random, after the sweepstakes close on Sunday, November 27th at 8:00 pm PST. 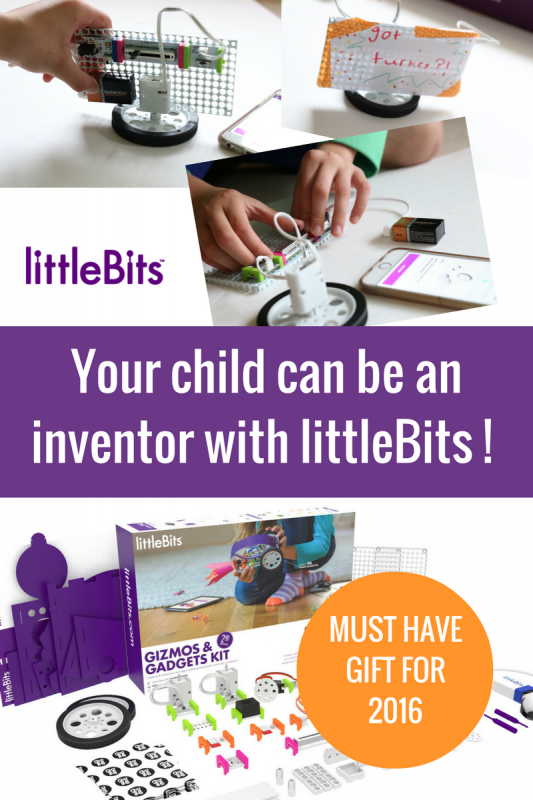 The winner will receive one littleBits Gizmos & Gadgets Kit valued at approximately $199.99. After the winner is notified, he or she has 72 hours to respond with their mailing address or another winner will be chosen at random. No purchase necessary.The number of eligible entries received determines the odds of winning. Any information gathered through the sweepstakes including email, and postal addresses will not be used in any way other than contacting winners and shipment of winnings. VOID WHERE PROHIBITED BY LAW. I am thankful to have our littlest one home from the NICU in time for the holidays! I’m thankful to have family nearby to celebrate with this year! I am thankful for free speech, a free press, and my public library. Celebrating seven years as a family. Love my man and beautiful kids. 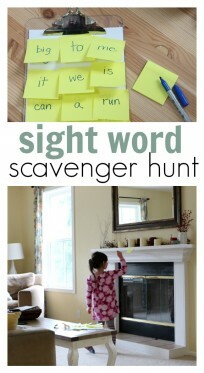 I am thankful for my sweet nephew who would LOVE this! I am thankful that my teenage foster son is in a good, safe place and that my family is getting back to normal after a highly stressful year caring for this high-needs child. I am also extremely grateful for modern medicine. Thankful for 4 beautiful children and a happy home. I am thankful for my family and our jobs that allow us to have so much more. I am thankful for a cozy rainy day today. I am thankful for the week off to relax (I hope) and enjoy my girls and family. I’m thankful that you are doing this giveaway :)! I am thankful for my children and health. First of all I am so thankful for family! Secondly, I am so thankful God has given me an important job like teaching. Working with these young kids is a privilege. It keeps me young to watch their enthusiasm for learning and the joy in their face with they have learned something new! 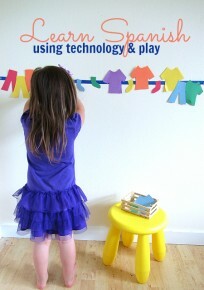 I love including technology in my classroom and so do my kids. I am thankful for my healthy, living famile! I am thankful for my two little turkeys age 7 and for who I love with all my heart! I’m thankful that my emergency surgery to remove a mass was successful and that the mass was not cancer, despite the doctors being convinced it was. In light of this, thankful to be recovering. And healthy to spend this time with my family. Not taking it for granted this year for sure! Where to begin? I am thankful for a healthy body, an open mind and a loving heart. I’m thankful for a job that I LOVE and families trusting me to love, guide and teach their little people. I am thankful for the love and closeness of my little family of three and the adventures we experience. I’m thankful for simple things like fine tea, a good book, yummy food and peace. I’m thankful for my family and their health. I’m thankful for my friends, I’m thankful for the new people that have entered our lives and made it so much brighter. I have so much to be thankful for this year! I’m thankful for some time off work for Thanksgiving and getting to spend more purposeful time with my kids and my husband. I am thankful for my healthy, happy children, my wonderful husband, and my warm and loving home. I am thankful for all my friends and family who love me no matter what. I’m thankful to be a mother! I am thankful for my children’s giggles. My home that we finally had a little extra money to replace our horrible old “white” vinyl kitchen floor. I am thankful that my children have a family that loves to spend time with them. I am thankful for free yoga videos on YouTube since without them I would never take 20 minutes for myself. I am thankful for my family, and their health and happiness! I’m thankful for my three healthy daughters. I am thankful for my family, the men & women serving in the US Military, my health and Benjamin Franklin. I’m thankful for my sweet nieces who are growing into smart, beautiful young ladies and are so enamored with science & knowledge. 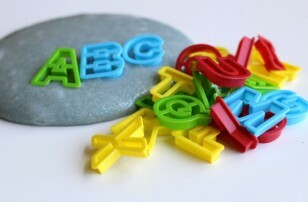 They would love to play with this! I am so thankful to have a happy, healthy family this holiday season! I’m thankful for my 3 sweet nieces!! I am thankful for my beautiful daughter and the great life we have together! I am thankful that that I live in a county that allows my family to meet and learn from so many different minds. We are thankful for two healthy kids and tine with family. I am so thankful for my awesome granddaughter! She will absolutely love and appreciate this!! I am thankful for my sweet grand babies! I am thankful for the Fortonlees. I am thankful for little A and Harold. I am thankful for Daniel’s daughters! I am thankful for Amanda’s girls! I’m thankful for my great friends and family, and awesome things like this that my girls would love! I am thankful for my family, friends, my home, food clothing shelter thankful for everything!